I registered some concern over the reappearance of Errol the Mower Man at the end of After You’ve Gone, and the early sections of Form and Voiddid nothing to dispel that. There’s something borderline perverse about the decision to devote so much time to the Spaghetti Monster’s domestic situation at such a late stage, particularly as it adds little of consequence to the overall picture. Indeed, the insertion of this scenario is somewhat awkward and wholly derivative. 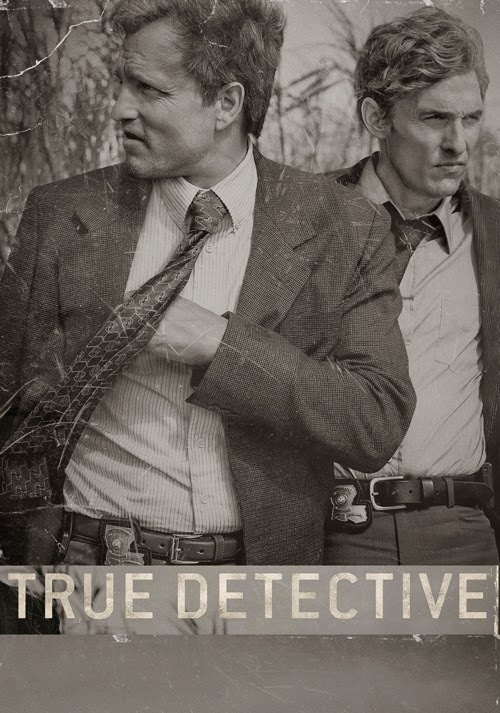 But, if the actual horrors encountered by Marty and Rust during the finale prove to be up there on the uninspired scale, Nic Pizzolatto nevertheless managed to genuinely surprise me with the chosen course of the final 15 minutes. 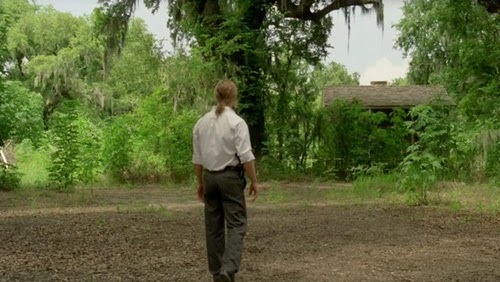 And Cary Funkanaga’s direction throughout is outstanding; the episode is laden with atmosphere (the series of dissolves of the significant and unsettling sites seen in the series prior to the final scene between Rust and Marty is a lovely touch), so much so it very nearly makes up for the two detectives encountering something rather anti-climactic and a little pedestrian (a common-or-garden evil) after all that build-up. Errol: My ascension removes me from the disc and the loop. Some mornings I can see the infernal plain. I fully expected a Fincher-esque descent into hell from After You’ve Gone. Rust left for dead, probably, and Marty screaming in silent horror over what he has been through, never to fully recover. There’s a nod to Sevenin there with the guy on the bed, his mouth sewn up, but that’s exactly the kind of element I was pleased True Detective avoided for so much it’s duration; the obvious. It appeared to actively eschew lowest common denominator terrors for a more pervading, apocalyptic dread. In general terms, Errol’s lair put me in mind of numerous backwoods horrors from Texas Chainsaw Massacre itself to The X-Files’ Home. Discovering that Errol is engaged in an incestuous relationship with his half-sister and paints schools while eyeing up prospective victims all seems a bit broad and clumsy. Nothing here really sets the Spaghetti Monster apart, other than his random predilection for James Mason impressions. During the first 10 minutes I wouldn’t have been at all surprised to see Fox Mulder knocking on the door before uttering some very droll remarks to Errol or his sister. It’s also unfortunate that the interplay between the pair bears more than a passing resemblance to the idle banter and decayed abode of Wayne and Waynetta Slob. If this “reveal” follows your standard serial killer trope, complete with dark and gloomy passage ways and the crazed beckonings that come from “divine” insight, I could perhaps see another intent behind Pizzolatto’s choices. The abuser comes from a cycle of abuse himself; he repeats by rote the traditions, habits and utterances of his elders rather than investing them with any actual power. Marty and Rust have arrived 15 years too late to catch the grand prize, so all that remains is the mutant misfit (even given we have been told he was “the worst”). Yet Pizzolatto wants to have his cake and eat it. As with the shoot-out in The Secret Fate of All Life, there’s an apparently deliberate attempt to undercut the mythologising. There it related to an invented altercation, one Marty and Rust invested with hyperbole to sell as a legitimate threat requiring justifiable force. Here, all those omens of Carcosa and whisperings of mass rites and depravity are reduced to a brute in a boiler suit. 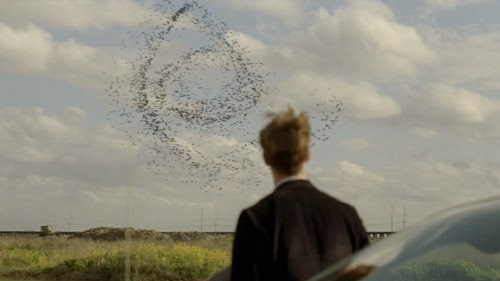 It doesn’t actually defuse the sense of uncanny of the previous episodes, the intimations of the supernatural that were never going to come to pass (although we’re still given a representation of the unknown beyond through Cohle’s unfortunately – for him – distracting hallucination). Or diminish the knowledge that this wasn’t just a lone nut at work. But at the same time this is just an unsubtle after-image of the horrors of the past, with all those liberally placed skulls and mummified corpses; the rug is pulled from under the grandiose moves played earlier. Additionally, we have the makers playing to the cheap seats, apparently shamelessly. The Seven guy on the bed, and Errol imbued with the momentum of an unstoppable killing machine. He’s up there with Michael Myers and his slasher-pic ilk. If Pizzolatto wanted to make a point, the two tecs should have come across a physicallyweak echo of the cult’s barbaric heyday, one whom they dispatch with disarming ease. It might not have satisfied, but at least it would have been more consistent. Errol: Come die with me, little priest. Instead, Pizzolatto and Funkanaga deliver the dramatic, full on, goods as they did with the climax to Episode Four. We’re treated to a bloody and tense showdown. But, as cathartically satisfying as it is it is, the route taken finds the series very nearly selling out its philosophical musings, and all for an immersion in viscera. Rust head butting Errol into releasing him, while transformed into a human shish kebab, is edge-of-the-seat adrenalising. It’s undeniably great television, but it’s all about the action fix, there to stop you dwelling on the more cerebral matters that previously held the attention. Pizzolatto is to be commended for those areas where he shows restraint. In particular, the decision notto have the case resolved to the satisfaction of anyone but the elite perpetrators who remain at large (or are dead) and are protected (as the news report dismissing the notion of Governor Tuttle’s involvement informs us). And the reminder of Sheriff Geraci who, in stark contrast to the reaction of Marty, is more consumed with taking revenge on Cohle than in behaving decently (it’s interesting to see how his initial reaction to the video is, if anything, even more horrified than that of Hart’s, but this makes his backtrack all the more unsavoury). And the mooted involvement of Marty’s daughter or family in the goings-on, something I was never especially convinced of, thankfully comes to naught. If the episode shows its hand in a negative way in this area, it’s that Maggie is reduced to little more than a bedside walk-on role while the men do what men do. Newsreader: In the meantime the State Attorney General and the FBI have discredited rumours that the accused was in some way related to the family of Louisiana Senator Edwin Tuttle. The limited scale of the showdown does not quite balance in terms of its impact on Rust and Marty, either physically or emotionally. Yet the catharsis and release of the final section is so strong, so powerful, that there’s little room to reflect on this while watching. All involved have pulled off quite a feat. 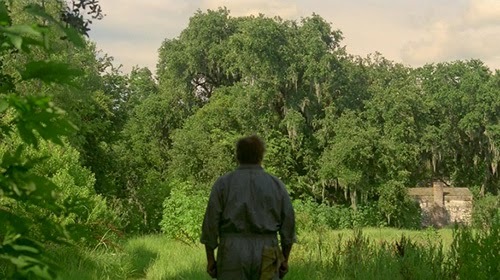 Instead of a story about one man being led intractably to his doom, pulled by that demon within him, True Detective becomes a tale of a man recovering his humanity. That man is Rust, but Marty too is given something. Marty, who had fallen back into weary pugilistic exchanges with the uncompromising Rust on the way to their date with the devil, now finds himself in a place where he refers to Rust as his friend. Inconceivable prior to this, and we don’t doubt him. Marty has seemingly come to a place of acceptance. He doesn’t need to know what the detectives Gilbough and Papania have to tell him about the case (something about voodoo worship is as much as we get). He knows he has done right, done good. He is content, even if he has more room for Rust’s reflections on the darkness out there than he did before. And when Rust breaks down, and Marty struggles to console him, the disavowal of the latter that has built up over the previous seven episodes just ebbs away. Marty: Well, I know we ain’t in Alaska, but it appears to me the dark has a lot more territory. But it’s with Rust that the real impact of Form and Void lies. 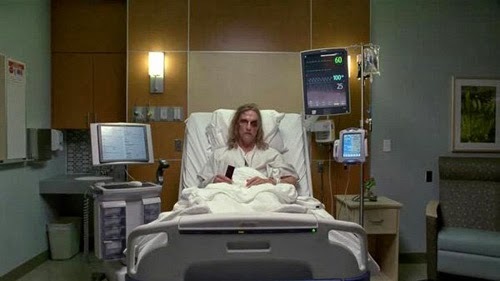 He was on a terminal mission, it seemed, and yet he was not taken (and he arises, his face consciously framed to look Jesus, or at least Turin Shroud, -like in his hospital bed. There’s a sense at the end that he has to accept something of Marty’s less interrogatory outlook. He has to accept. He tells Marty that he shouldn’t be here, that he wanted to go when “I could feel my definitions fading” because he could feel his daughter’s love there in the darkness (and that of his father too). This is the kind of earnest “love conquers” sentiment that really shouldn’t wash, particularly given the thundering darkness that preceded it. But there’s nothing mawkish or indulgent here. While I don’t think the Errol re-entrance is wholly successful, the aftermath caught me off guard and rose to the challenge of its intent. Perhaps because Rust doesn’t suddenly become a nice guy. Rather, the barrier that comes down is something he cannot deny; recognition has broken through on a fundamental level, speaking to his philosophy and his soul, striking at those positions he has professed so eloquently and disdainfully over the previous episodes. Rust: We didn’t get them all. I can quite understand how this turn of events might be seen as disappointing, and I have a number of issues with the finale besides Errol. It’s notable how little actual detective work is required of our heroes. I commented last week on their rather underwhelming abilities, Rust included given the sheer span of time involved, and I couldn’t help but groan here when their deductive leap is based on Marty making a connection with some green paint. There’s only so much commenting on, and playing with, conventions you can get away with before you really needto deliver the goods as a writer, and Pizzolatto falls at a number of narrative hurdles during the last stretch. He’s very lucky, because he pulls us on side with a last emotional slow motion victory lap to the sound of Vangelis. I may see the prior substance of this episode more favourably when I revisit the series as a whole, but at present I tend to the view that the problem is not that the great and bad aren’t busted; it’s that Pizzolatto settles on been-there-seen-that villainy, and inelegantly incorporates it at the last moment. There’s a lack of balance of forces here too; what if The Silence of the Lambs had featured only Buffalo Bill? Or if R Lee Emry had played the villain in Seven instead of Spacey? 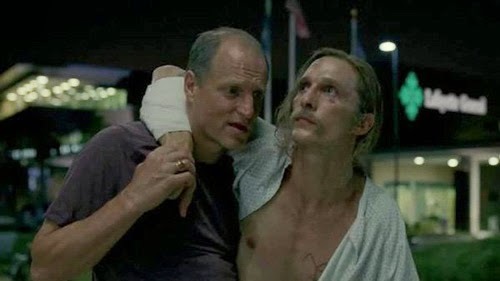 The dramatic weight rests entirely on Cohle’s revelation, which may be as it should, but there are 35 minutes of the inbred underground before that. Rust: You’re looking at it wrong, the sky thing. Rust: Well, once there was only dark. And if you ask me, light’s winning. I read Pizzolatto didconsider a supernatural option, and also mooted offing one or both the leads, but chose what he felt was right for the characters. Maybe so on both counts, but he misses something in the process. By leaving its darkest recesses out of sight, he is required to verbalise the ongoing battle against good and evil in the final moments (apparently lifting this sentiment from Alan Moore, but it’s such a good riff we shouldn’t begrudge him). 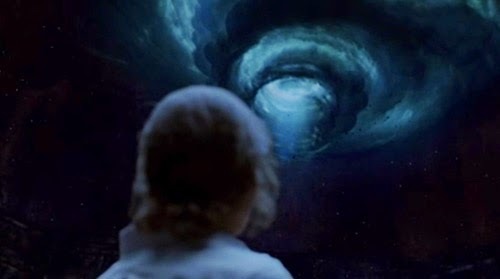 It’s an effective summation between Marty and Cohle, not only for rediscovering Rust as one now gifted with hope but also for concluding the cosmic discussion that has infused the series. Less exotically, I was also put in mind of Last Boy Scout, where new pals and partners Bruce Willis and Damon Wayans discuss how they need to be alert to old Satan Claus, who’s out there and getting stronger. So what do we do about that, asks Wayans. “Be prepared son, that’s my motto. Be prepared.” Perhaps Pizzolatto wasn’t borrowing from Alan Moore at all.